A faulty air conditioner can make the conditions in your home intolerable. And a house that's too warm inside even poses health risks, such as heat exhaustion and dehydration. So, if your A/C unit begins to function poorly or goes out-of-commission, contact Bloomington Heating & Air for emergency repairs. As long-time experts in the HVAC industry, our HVAC repair company performs AC repair residents can depend on. At Bloomington Heating & Air, we understand that air conditioner problems don't always happen on your schedule. That's why we provide 24/7 emergency HVAC repairs. Day or night, if your AC unit malfunctions, our technicians will respond to your call for service. And what issues justify "emergency" AC repair may vary. An air conditioner that has ceased to function needs immediate repair to restore your home to a livable condition and prevent health concerns related to heat exposure. But even an A/C unit that functions somewhat yet operates noisily or doesn't blow cold enough air is a nuisance that might cause you some sleepless nights. 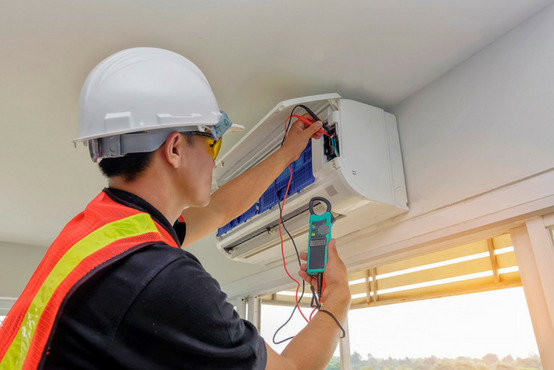 No matter the type of problem that befalls your air conditioner, our technicians will respond at any hour of the day to repair your home’s A/C unit to efficient working order. Refrigerant Leaks: Refrigerant leakage impacts the performance and efficiency of an air conditioner. But if your a/c unit leaks, replenishing the refrigerant is only a temporary solution to a deeper problem. Instead, it takes a trained HVAC technician to fix a refrigerant leak and restore an air conditioner to peak working order. Sensor Problems: Thermostat sensors that are damaged or set in the wrong position can incorrectly read the level of warmth in the air. An A/C unit with faulty sensors might turn on and off at irregular intervals instead of responding to the conditions in your home. Electric Control Failure: An air conditioner's compressor and fan controls can wear down due to regular long-term use. Worn-out controls, in turn, can disrupt the electrical connections and render an A/C unit unable to turn on and off. Drainage Problems: A condensate drain removes the condensation that forms when warm air meets the evaporator coil of an air conditioner. But a condensate drain clogged with dirt or algae will elevate your home's humidity levels and potentially cause mold and water damage. Mechanical Issues: Insufficient HVAC maintenance can lead to mechanical issues in an air conditioner. Common mechanical problems for an A/C unit include a fan with a burnt out motor or loose belt and a compressor with dirty coils or blocked lines. If your air conditioning unit experiences any issue, it is important to have the problem addressed as soon as possible. Leaving an issue unrepaired could lead to more extensive damage to the system making the repair more expensive and time consuming or even break the unit beyond repair. The lack of cool airflow in your home for a long period of time can create health risks such as overheating and dehydration. The lack of air conditioning can also cause foods to go bad quickly and allow moisture to build up promoting mold and mildew growth. If your unit stops working, contact Bloomington Heating & Air for an immediate air conditioning repair residents can trust.